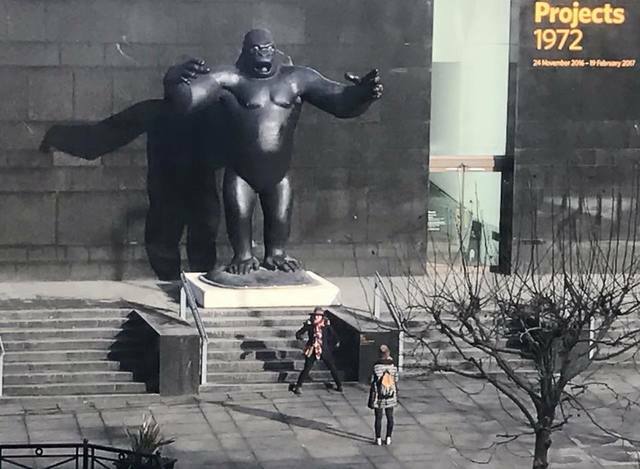 The King And I is an exhibition of artists’ responses to the current presence in Leeds of Nicholas Monro’s sculpture of King Kong, on the steps of the Henry Moore Institute as part of the exhibition, City Sculpture Projects 1972. 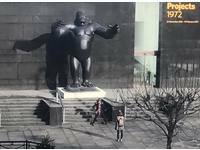 Responding to the 1972 brief that the city sculpture commissions should be “city oriented”, Monro chose instead to create an image of urban disorientation in the figure of King Kong. 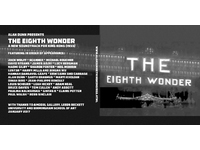 For most of its forty-four-year existence the work has also occupied a position of disorientation from the art world, as to some extent has Monro himself, concentrating now on scientific experimentation rather than art-making. 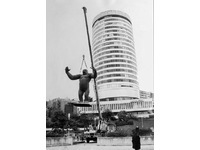 The sculpture remained in the location for which it was commissioned, Manzoni Gardens in Birmingham’s Bull Ring, for only six months, after which it was then used for extended periods to promote used car dealerships in Birmingham and markets in Scotland and northern England. During that time it was frequently garishly repainted as well as being damaged by regular transportation, outdoor storage and occasional vandalism. 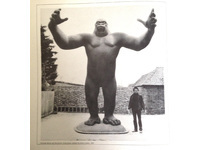 But now King Kong has been restored by its current owner, and The Henry Moore Institute exhibition has recovered its status and significance as an artwork. 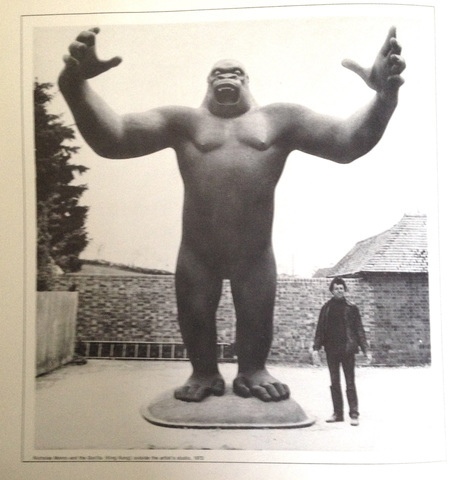 Our exhibition builds on Monro’s idea of disorientation and reflects the changing status of the King Kong sculpture over time, including the memories, narratives and mythologies that have surrounded its often mysterious disappearances and reappearances, and the varying reactions to its public display, reviled by some and lovingly celebrated by others. 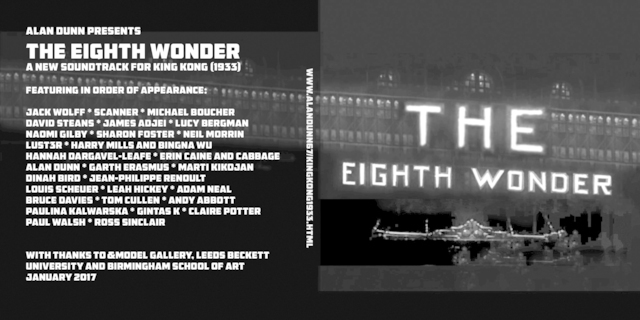 For much of its lifetime the work has existed more in the imagination than the experience of its admirers and detractors and so, as the title of our exhibition suggests, we are presenting works based on the relationship between the idea of King Kong and the individual artists involved rather than on direct responses to the original sculpture. 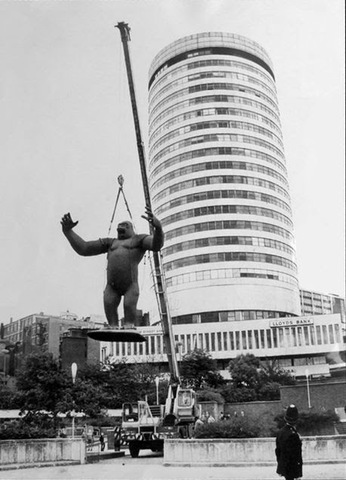 Building on the fact that King Kong was originally commissioned for the city of Birmingham, our exhibition will include work in printmaking, audio art, sculpture and digital 3-D modelling produced in a collaboration between art and architecture students at Leeds Beckett University and Birmingham School of Art, alongside responses from several more established artists.